To isolate the construction site, and protect it from flooding, two cofferdams were constructed. Construction of the upper cofferdam began in September, 1932, even though the river had not yet been diverted. A temporary horseshoe-shaped dike protected the cofferdam on the Nevada side of the river. 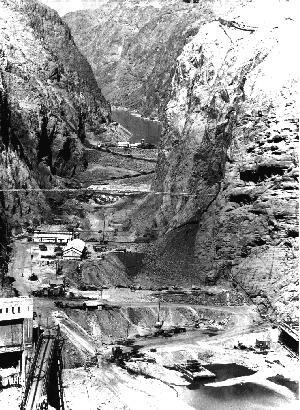 After the Arizona tunnels were completed, and the river diverted, the work was completed much faster. The upper cofferdam was located approximately 600 feet down river from the inlet portals of the diversion tunnels. Before the cofferdam could be constructed, 250,000 cubic yards of river silt had to be removed to provide a firm foundation. When completed, the upper cofferdam stood 98 feet high, and reached about 30 feet above the top of the diversion tunnels. The dam was 450 feet long, 750 feet thick at the base and contained 516,000 cubic yards of earth and 157,000 cubic yards of rock. The upstream face was protected by a 6" thick concrete paving laid over 3' of rock blanket. The downstream face was covered by a thick rock fill. This cofferdam was designed so that if the diversion tunnels were discharging water at 200,000 cubic feet per second, the water would still be 13 feet below the crest of the cofferdam (200,000 cubic feet per second was the largest flow of water ever recorded through Black Canyon). 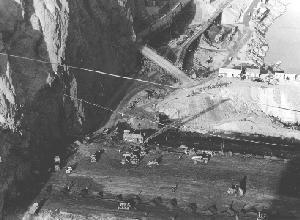 Work on the lower cofferdam was delayed while the high-scaling of the canyon walls above the sites of the power plant and outlet works was completed. The lower cofferdam was built of a compressed earth fill. It was 66 feet tall, 350 feet long and 550 feet thick at the base. The cofferdam contained approximately 230,000 cubic yards of earth, and another 63,000 cubic yards of rock. A thick rock fill covered the downstream side of the cofferdam. Because the lower cofferdam was made of a soft earth fill, there was concern that during floods, back washing from the outlet portals would damage the cofferdam. To lessen the force of the water, approximately 350 feet down river from the lower cofferdam a rock barrier was built. This barrier was 54 feet high, 375 feet long and 200 feet thick at the base. It contained approximately 98,000 cubic feet of rock. The cofferdams, rock barrier, and diversion tunnels were all completed before the spring floods of 1933. The engineers watched nervously to see if the dams would hold. They did, and the diversion tunnels easily handled the flood waters. The work of actually building Hoover Dam could begin.